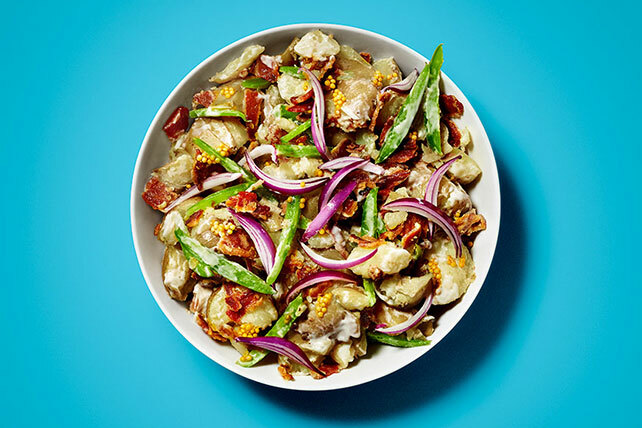 Whip up this smart, creamy salad of potatoes with peppers and bacon for big fireworks at your next potluck. Mix MIRACLE WHIP and pepper until blended. Combine remaining ingredients in large bowl. Add MIRACLE WHIP mixture; mix lightly. Prepare using MIRACLE WHIP Light Dressing or KRAFT Real Mayo Mayonnaise. Serve this classic potato salad with grilled chicken breasts and a fresh fruit salad. Stir 1 Tbsp. GREY POUPON Dijon Mustard into salad before chilling.